So I spent this past Memorial Day remembering those from the Rebel Alliance, who so bravely fought against the Galactic Empire. 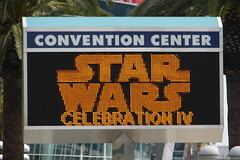 That is, I went to Star Wars Celebration IV, which commemorated the 3oth anniversary of the first movie. I did see the film in the theater that summer, at age 6 and 3/4, and it had an impact on me. Well, I was inspired to hang a poster of Luke Skywalker in my bedroom at least. E was a 10-year-old boy in 1977, the key demographic of Star Wars: A New Hope. He's told me, but I can't remember how many screenings he sat through, back to back. 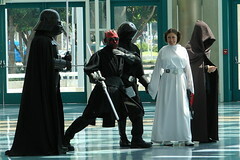 So, for E, the big Star Wars convention taking place in Los Angeles last weekend was a big deal. Many months ago, he joined the fan club and purchased the 5-day pass. While he'll tell you that the event was not very well run in many aspects, he did have a great time. One of our friends went with him for a few days and the two of them ended up shooting a movie involving many of the people in costume. I chose to go for only one day and I think that was plenty for me. I didn't go to any panels, but that's okay. I was able to get some merchandise 50% off, since it was the last day. 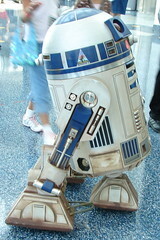 My two favorite things were the Vader Project and all of the droids roaming around, courtesy of the R2 Builders Club. I took plenty of photos of each, but haven't gotten around to posting them yet. E met some of the droid builders and hung around after hours to take some 3D video for them. I have a feeling we may have a homemade droid entering our lives sometime within the next year or so. 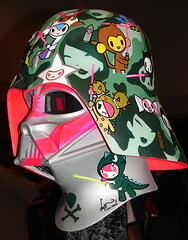 The Tokidoki Vader helmet was probably my favorite! Go figure. I took some video of some of the droids in action, including a conversation I had with one, but who knows when or if I'll get around to posting those. Very cool. I fit into the same demographic as your husband - I was 10 (about to be 11 in 14 days) when it came out and over the next few years, I probably saw Star Wars in the theater over 15 times (it's probably closer to 20 now, not counting the times I've seen it on TV, VHS, and DVD in all of its incarnations). I was 17 at the time, and I remember that all my geek friends were absolutely nuts about Star Wars. I was too busy riding bike races at the time and I didn't get around to seeing it until 1980 or so. Oh please dear god, tell me that video-ed 'conversation' you had with a droid involved you with cinnamon rolls stuck to your head and the words, "Help me, Obi-Wan Kenobi, you're my only hope." lol @ Justjen ... and wearing a long white sheet and wringing your hands. I can hardly believe it's so old now. I still love R2D2 the best. Memorial Day 1977, a week before my 16th birthday... Theaters sucked back then. It was the new age of long, flat-floored, box-car like multiplexes. Passing were the days of the big theater with a stage, red velvet curtains that opened and closed, cushy seats, a seriously sloping floor, and a balcony. Better to see a new 30th anniversary print now in really good surround sound in a new, big theater. Wow. I thought I was older when Star Wars first came out but I was only 3 so now that I'm thinking about it I don't think I've ever seen it in theaters. I remember seeing The Empire Strikes back in the back of my parents' station wagon at the drive in. (It was coupled with The Man from Snowy River I think. How weird...) I did watch it a million billion times on video tape when my friend (who had a VCR before my family) taped it off TV once. Also the Vader helmets, kind of creepy but really cool at the same time. Rusty hanging out at the Special Olympics.